Duty Free on a train or at the station - can you buy? Blog Home > What is Duty Free? > Can you buy Duty Free on a train or at the station? Can you buy Duty Free on a train or at the station? A Much asked question from travelers wanting to shop. Can you buy Duty Free on a train or at the station? This really would be duty free on arrival, if it was possible, but generally it is not, certainly not within The European Union. 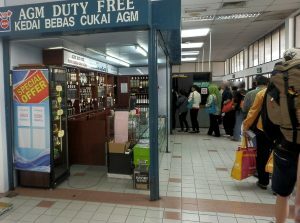 Buying Duty Free on the train or at the station – possible? 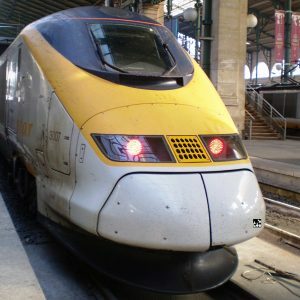 The Eurostar high-speed train which runs between London and Paris or to Brussels, is one of the most famous, due to its 30 minute journey under the English Channel and through the Chunnel. We see numerous searches coming to our online duty free database, researching whether there are duty free shops at the Eurostar stations in England or France. Many people from outside Europe assume that because this train crosses Borders, duty free shopping must be available. Sorry, but there are no duty free shops at either end, nor on the train, because within The EU this is not allowed. The same applies to the stations, just as the other fast EU trains, Thalys, TGV, AVE or others have no duty free shopping facilities. There are stores discounting goods, some call themselves “Tax Free”, but this really means that any goods sold may have the local sales tax discounted so to attract customers. But they are not real Duty Free Shops. That said, the prices can often be competitive, especially for tobaccos or liquors and if you travelling into the UK, you’ll probably find the prices for these products are more expensive when you get there. The Channel Tunnel Terminals for motorists also have large discount shopping areas on departure, but again, these stores are not allowed to sell duty free. Prices might still work for you and it might be convenient, but the large savings have now gone since duty free shopping was abolished by The European Commission. So where can you buy Duty Free on a train or at the station? Duty Free on Chinese trains? Inland at malls, but not on the train. Hong Kong, for one, has a multitude of stores in its Terminal serving passenger trains to the Chinese cities of Guangzhou and Shenzhen and some of these stores are indeed Duty Free. You could then travel on to Shanghai or Beijing from there, it’s a long journey, but the Chinese State has embraced the sale of Tax Free luxury goods. They now have a number of Domestic Malls where you can buy goods inland and Tax Free. Another interesting case is the train that runs from Singapore, via Malaysia and on to Bangkok and at the Border Crossing between Malaysia and Thailand, you will indeed find a Duty free shop at the Passport Control. 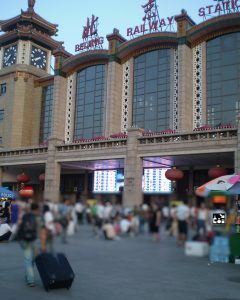 Passengers must change trains at this point and in-between you will find a Duty Free store selling liquors, tobaccos and a range of other goods. Then there is Russia, a vast country with the famous Siberian railway which passes through various countries on its way to China. At the different Border Crossings there are stores and vendors, what exactly is duty free or not is debatable, but for sure you can buy at good prices. Just the same as Russian trains run into Finland, where you will find Duty Free Border Stores. If you can get off and back on is another matter, but the stores are there. Just the same applies to the Ukraine, but in view of some recent turmoil, what duty free is actually available at these Borders is unclear. Duty Free shopping in North, Central or South America? Trains are not really such a major form of transport in these continents compared to Europe or Asia, so duty free on a train or at the stations is not searched so often. Bus, car, van or coach travel is more common, so cross-border shopping is the major question for these places. And we will deal with this issue in another post, or if you need information now, search our border shopping directory here. Next Next post: Duty Free Allowances on arrival – avoid the confusion – check before you fly!